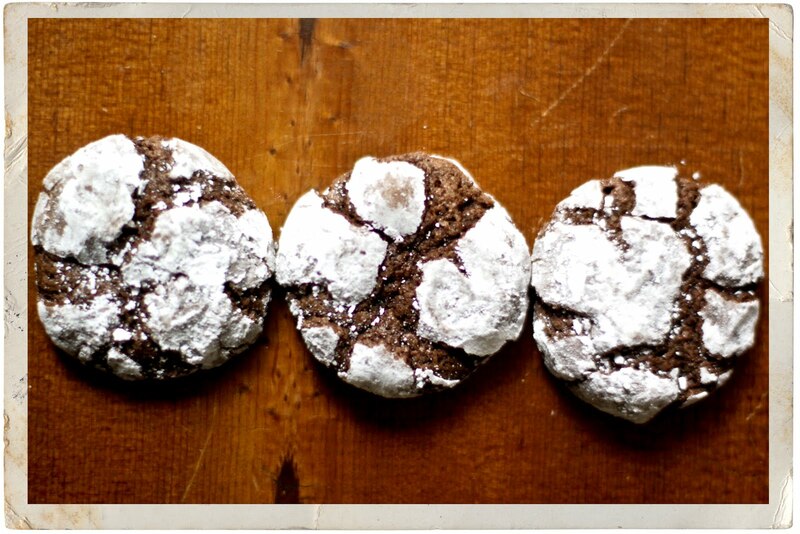 chocolate crinkles are an important part of the winter holidays in our family, in fact i don't think my sister could celebrate christmas without them because my mom made them for our friends & family each year. now i make them for the holidays and all winter long because they are just so good! mix oil, chocolate and sugar. blend in one egg at a time until well mixed. add vanilla. measure flour by dipping or sifting. stir flour, baking powder and salt into oil mixture. chill several hours or overnight. heat oven to 350. drop teaspoonfuls of powdered sugar. roll in sugar; shape into balls. place about 2" apart on greased baking sheet. bake 10 to 12 minutes. do not overbake! makes about 6 doz. cookies. i used cocoa powder & additional oil instead of chocolate squares. there is a handy little measurement on the cocoa powder packaging (3 tbsp of cocoa powder + 1 tbsp of vegetable oil = 1 chocolate sq) and that's just how we've always made them! Your photo is beautiful, dear!